September 21, 2013 2 comments on "Elderberry Syrup Recipe"
Last summer I picked a bunch of elderberries for the first time. I had so much fruit to can that I didn’t have time to do anything with the elderberries so I just put them in the freezer. I later decided to try making a batch of elderberry syrup from them. It’s really easy! First a couple of notes about elderberries. First of all elderberries contain seeds that are very bitter. All the recipes I have seen using elderberries have you strain the berries through a very fine mesh strainer or a food mill to get rid of the seeds. I own both of these tools, and if you do very much canning I really recommend getting both of them. Strainers are great for quick, small jobs, but if you like to make jellies and syrups, a food mill is a must! (It’s also GREAT for making apple butter). It is also important to note that elderberry stems are very TOXIC. You do not want to ingest them or they will make you very sick. Elderberries are very easy to harvest. You can harvest several pounds of them in a matter of minutes. It can then take an hour or more to remove the stems! One easy tip is to freeze the berries before you try to remove the stems. The stems come off a lot easier when they are frozen. Running the berries through the food mill also helps remove any stray stems. These measurements are approximate. I was kind of winging it as I went along, but the syrup turned out great! This recipe will make approximately 3 pints of syrup that you can either can for later or put in the refrigerator for up to a year. First rinse off the berries and place them and the 3 1/2 c. water in a large sauce pan. You want half as much water as berries, so for 7 c. berries, use 3 1/2 c. water. Simmer the berries until they come to a good boil. Next press the berries through the fine mesh strainer or a food mill to remove the seeds, pulp, and any leftover stems. Return the remaining juice back to the sauce pan, measuring it as you pour it back in. If you started out with 7 c. berries, at this point you should have approximately 5 1/2 cups of liquid remaining. However much liquid you pour back into the pan, add that much sugar (in this case, 5 1/2 cups sugar). Bring liquid to a boil, stirring occasionally. Cook until liquid thickens slightly and reaches 220 degrees F on a candy thermometer. Use a funnel to pour the syrup into clean jars. Syrup can be stored in the refrigerator for up to one year. If you would like to can the syrup, this recipe makes approximately 3 pints of syrup. Pour the syrup into clean, sterilized canning jars, within 1/4 inch from the tops of the jars. Wipe the rims of the jars with a damp cloth. Place canning lids and screw bands on the jars. Place jars on elevated rack in boiling water canner. Water must cover jars by 1 to 2 inches. Cover, and bring water to a gentle boil. Process jars for 10 minutes. Remove jars from canner and place upright on a towel on the kitchen counter to cool completely. After jars are cool, check seals by pressing middle of lid with finger. If lid springs back the lid is not sealed. Did you know that elderberry syrup has medicinal qualities!? Elderberries are full of antioxidants. Many people use it as a home remedy for the common cold. Just take a tablespoon of it a couple of times a day while sick, and it will help you get well faster. 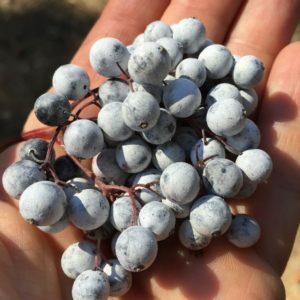 2 Comments on "Elderberry Syrup Recipe"
I know this is an old post, but is it safe to can it this way? I’ve heard that elderberries need to be pressure canned because of their acid level.